Provides the simplest and easiest application on the market. Saves the nail technician valuable time and money. Has 40% less odor than other systems (attract clients that have trouble tolerating high-odor products). The enhanced color stabilizers ensure no yellowing, and the "plasticizers" act as shock absorbers, eliminating the chipping and breaking associated with other monomers. Does not contain MMA. The HD Primerless Monomer creates its own adhesive bond for the strongest possible adhesion of acrylic to the nail plate without damage to the natural nail. 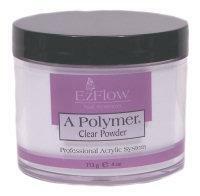 EzFlow's newly developed Plasticizers give technicians 30% more elasticity than previously produced monomers. It contains stabilizers that control the speed of the chemical reaction, thus workability has significantly improved. 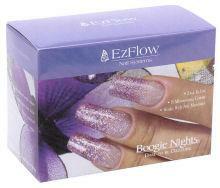 Specially formulated to create the long, lasting, durable, beautiful nails that made EzFlow famous. 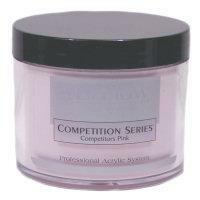 Encapsulates important additives that initiate the drying of the polymer when mixed with the monomer. These additives eliminates air bubbles in the finished product. Will not crystallize due to cold weather. Consistent color and pigmentation. The HD Acrylic Powders incorporate the flexibility and performance of a homopolymer while maintaining the adhesion and application control of a copolymer. The Smart Polymer and Optical Brighteners are time released through encapsulated Microspheres. 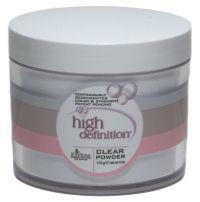 The Plasticizers continue to strengthen the HD nail during the life of the enhancement. Optical Brighteners use a blue colorant base that eliminates any discoloration. Whites look whiter, pinks pinker, and clears are clearer with the additional benefit of UV protection. With just one simple application, erase fill and repair lines on acrylics, tips, wraps and gels. 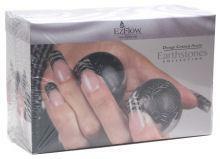 EZ Erase levels previously applied product bonding with the natural nail during fill application. Eliminate tip seams and less filing. No more line! Great for moisturizing dry cuticles. 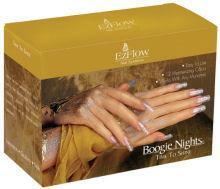 The moisturizers penetrate deep into the skin for healthy, growing natural nails. Essential Oil Plus will not affect the wear of artificial nail products. When mere moisturizer is not enough, use Fade Away transparent gel to melt away tough cuticles that easily get out of hand. Just one application gently removes dead skin around the nail, leaves cuticle area moist, refreshed and refined. Specially formulated natural nail strengthener designed to enhance the integrity of the natural nails. 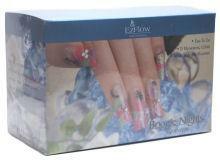 It will also rejuvenate the nails after artificial nails are removed. 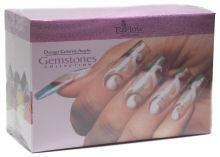 Protects nails from ultra violet exposure. The reflective barrier in UV 30 is also an optical enhancer that brings out the natural look of the nail bed and white of the free edge. Not for use with nail polish. Kolinsky Bristle size 8 oval brush. This universal brush can be used for creating perfect smile lines, precision cuticle applications, fill in maintenance, and intricate design work. Comes with a aluminum brush cover to protect the delicate bristle. All purpose professional brush cleaner to remove excess acrylic build up from the brush while conditioning the bristle. Helps to lengthen the life of your brush while maintaining precise performance. Soak brush or nails in solution until acrylic softens. Repeat if necessary. Use this with Brush-On Resin for fast and easy applications that create thin, strong fiberglass nails. Dries in less than 15 seconds. This hazard- free product is free of pitting, Freon and III Trichloroethane. Easy-to-use mesh is heavy, yet sheer for strong silk extensions with outstanding clarity. Crystal clear, natural fiber, pre-adhesive, and silky smooth. Sheer Glass 100% pure woven fiberglass. This product adds strength and flexibility, and is more durable than linen or paper. Crystal clear, 50-50 weave, plasti-fiber, and pre-adhesive. 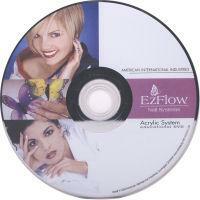 Complete training system for mastering EzFlow Acrylic System in DVD format. Step-by-step guide in sculpturing pink and white, 4 color fade with 3-D flower, tiger stripes, and flower design. As beautiful as a rare flawless diamond and as precious as a delicate pearl, there is nothing more beautiful than bejeweled nails that shine with a supernatural luster. Flash your love of the fabulous with these gorgeously glamour worthy glitters! A woman's nails always showcase her personality, so be fierce and fun-loving with Precious Gems Glitters. Whatever your fantasy is, Precious Gems glitters come in a variety of colors that turn your fantasies into a beautiful reality. Blends with gel and clear acrylic. Can be used with ibd gels.